The Twin Towers project is expected to break ground this fall. LOGAN SQUARE — The proposed "Twin Towers" project that had divided Logan Square residents over the past year is expected to break ground next month. Alderman Proco Joe Moreno (1st) praised the project at the developer for including 15 percent of the more than 200 units as affordable, greater than the city's required 10 percent for developers. The development includes two 11- and 12-story buildings along Milwaukee Avenue just southeast of Fullerton Avenue. Moreno stressed the density is a friend of affordable housing advocates and this project would benefit longtime neighborhood residents who are facing rising rents. "It's going to help stabilize market rate rentals because we are going to have more of a supply and it's going to supply more housing near our transit," he said. "That's what we want. Density near transit." The developer on the project was issued his first building permits Tuesday to begin construction on the foundation and caisson. At a community meeting last week, Moreno voiced his support for the plan and said it will bring in influx of property tax dollars to the cash-strapped city from what is now vacant land. The landowner currently pays about $19,000 in taxes per year on the empty lots, but that number will bump up to about $300,000 when the development is complete, according to Moreno. Since the building is in a Tax Increment Financing district, an estimated $280,000 of those tax dollars will go into a TIF fund each year that Moreno pledges will only be used on affordable housing and school improvements in the ward. Moreno said the developer hopes to break ground next month and the project will take between 18 and 20 months to complete. While the project will the neighborhood's largest development, it was originally proposed as two 11- and 15-story buildings. The developer, Rob Buono, scaled back the project after pushback from some community groups and residents. The main concerns raised by opponents of the project have been the height of the buildings as well as gentrification of the neighborhood. "There's always a few haters and groups that pop up and don’t understand what it means to bring affordable housing," Moreno said Wednesday. "Density is not the enemy of affordable housing. It's its friend." Moreno pointed to Lincoln Park as an example of a neighborhood that has been losing density and blocking development resulting in rising rents. "The neighborhood could turn into Lincoln Park," he said. "The density could be so low they are losing population." 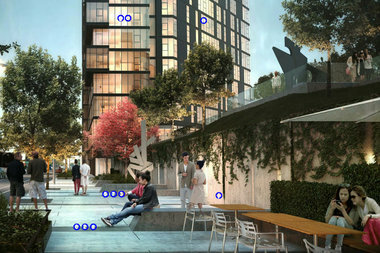 The project is a transit oriented development, meaning the requirement to include a parking space for every unit is nullified due to its proximity to the California Blue Line stop. The proposal does include a 68-spot covered parking garage and 15 percent of the units will be affordable housing, a mandatory requirement of all developments in the 1st Ward. The developments, which are being built on vacant lots at 2255-93 N. Milwaukee Ave., 2208-26 N. Washtenaw Ave. and 2715-35 W. Belden Ave., will also include retail.